I’m still here! I don’t think I’ve taken 2 days off from blogging in a row since I started. But this has been one intense week. In fact, right this minute, I am supposed to be enjoying a lovely night out with Melissa, Melissa, and Julie. But I knew yesterday that there was no way I would be in a place with my school work that I could take an entire evening off. I was right. I didn’t finish my test tonight until a half hour later than I would have had to have been out the door. Bummer! I feel so lucky to have been able to meet such lovely ladies so close to home, and I feel a little flakey for having to bail out. Fortunately, when January comes, I will have a lot more time to play! Who wants to play with me???? I am making the best of my night in. Poor Dave has been a real trooper this week, putting up with a very stressed out Shannon (who has ocassionally collapsed in a puddle of tears over the last several days!). So its not an entirely bad thing that I am home tonight to give him a little bit of attention. 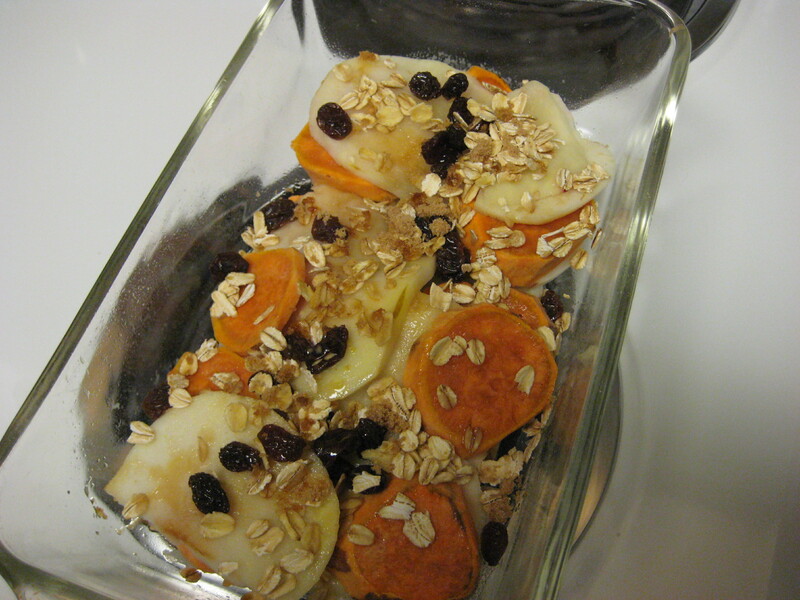 I made a yummy dinner to celebrate the completion of my last test before finals (tomorrow begins finals preparation!). 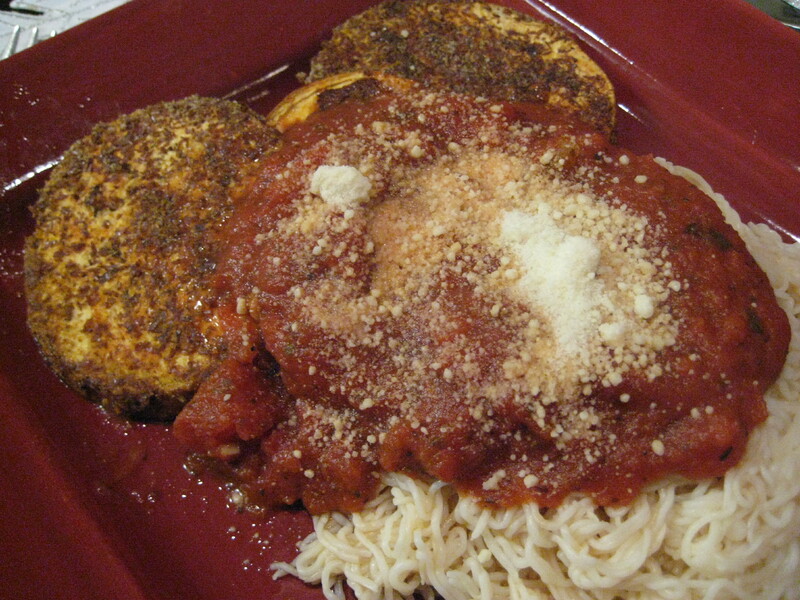 I made one of my very favorite things….flax-dipped eggplant parmesan. It’s so easy, but so good. I just slice the eggplant, dip it in egg, and then dip it in a mixture of ground flax seed, italian seasoning, and parmesan cheese. Delish! I served some gluten-free shirataki noodles on the side. All topped with Classico’s Tomato Basil marinara sauce. This is my favorite bottled sauce. It’s not too sweet, which I find in most other bottled sauces. I had some leftover eggplant slices after running out of flaxseed, so I dipped the eggplant in the egg and stuck it in the oven. I came out looking like little french toasts! I’ll let you know how it worked out when I try them. It’s 7:30, and with the exception of a workout break and a vacuuming break, I have been doing biology and stats since 7am. I think I am going to call it a night and go spend some quality time with my boys. Jack is already comfy! 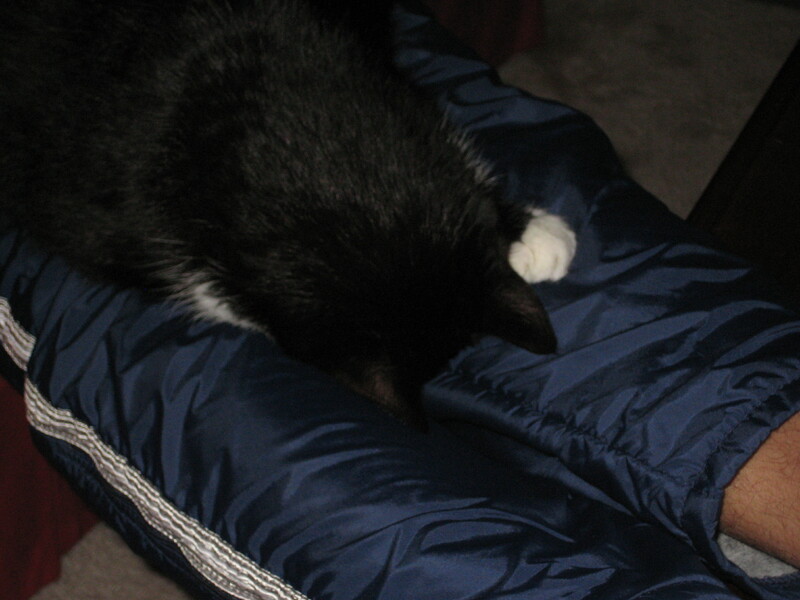 I don’t know how Jack can breath when he does a face plant like this! But it is his preferred cat-napping position! Perhaps you remember this post. 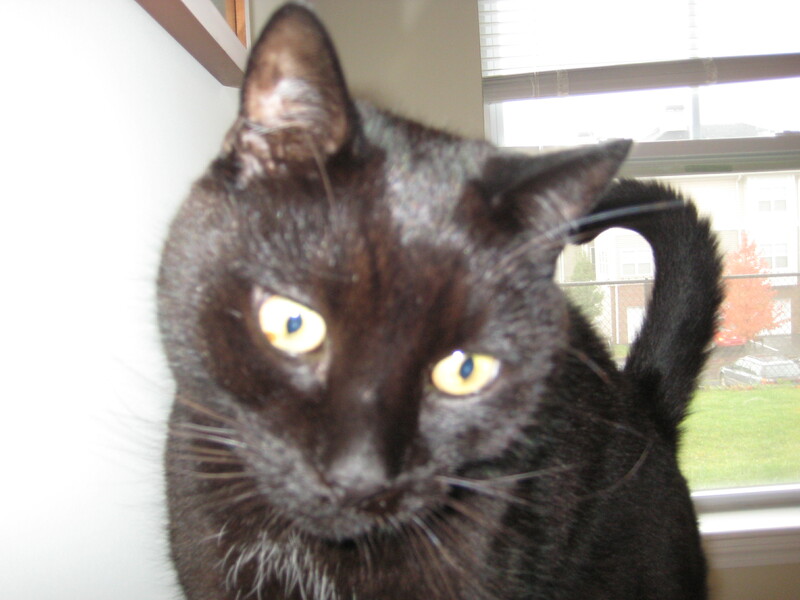 That day, Rudy the Cat ate several crescent rolls right off the counter. There was also this post, where the little rascal ate his way through a bag of hamburger buns! Just this past weekend, while Dave and I were away for the holiday, the same suspect knocked a bag of English Muffins from the top of the refrigerator, broke through the plastic bag, and ate 4 muffins. The shredded bag was on the floor when we returned. And those were the high fiber English Muffins!! 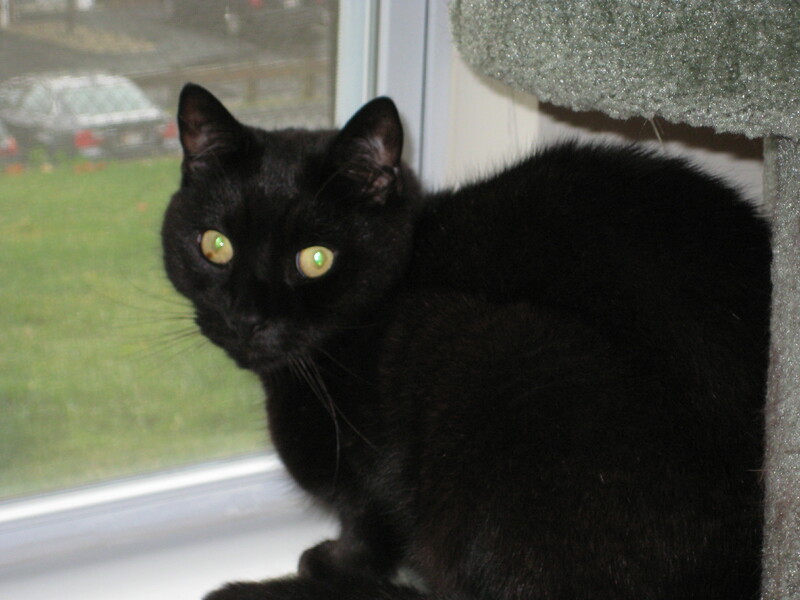 His little tummy was not happy, and let’s just say, cleaning the litter box was not fun! When I went to put it into the oven, I found several apple slices on the floor, and a very guilty cat racing away from the crime scene. I managed to salvage most of it, and it came out wonderfully. But next time, I will make sure to keep it (and anything else that might tempt the little thief!) in the fridge until it’s time to bake. …. but look at those eyes when he is zeroed in on something he wants! Despite the missing pieces, my dessert did come out quite well. I topped it with some cool whip. Mmmm! Dessert was so healthy, I could have eaten it for dinner. But for dinner, I made my flax-encrusted eggplant parmesan. 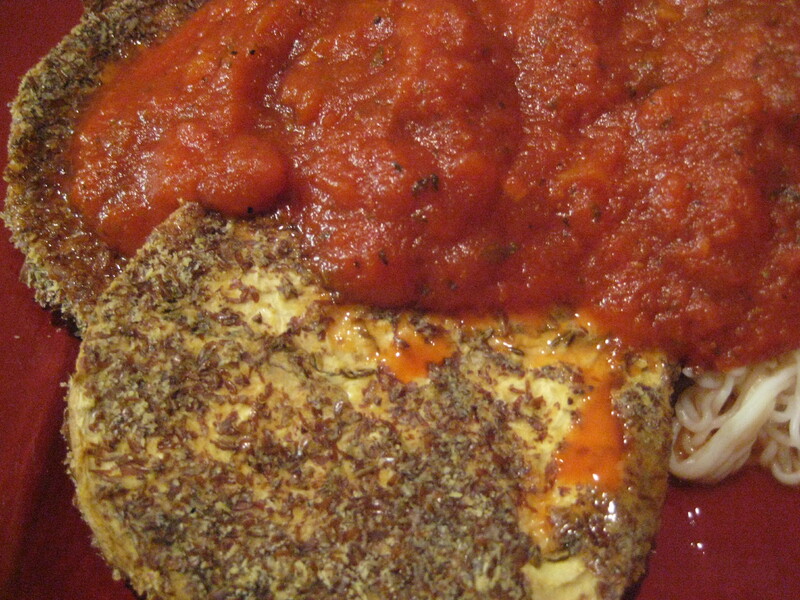 I dipped my eggplant slices in egg and tomato sauce, and then dipped them into ground flax seed. After baking, I paired it with some shirataki noodles and marinara sauce. 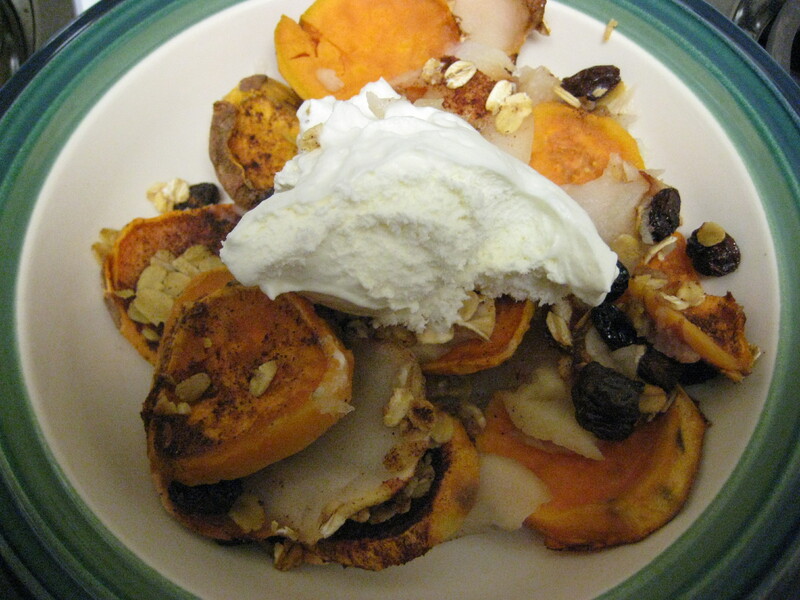 This is one of my favorite repeat meals! I have even gotten used to the gluten-free shirataki noodles. After washing them thoroughly and then heating them, the smell that turns many people away when they first come out of the bag, is gone. All that being said, Dave was happy that he can have gluten! 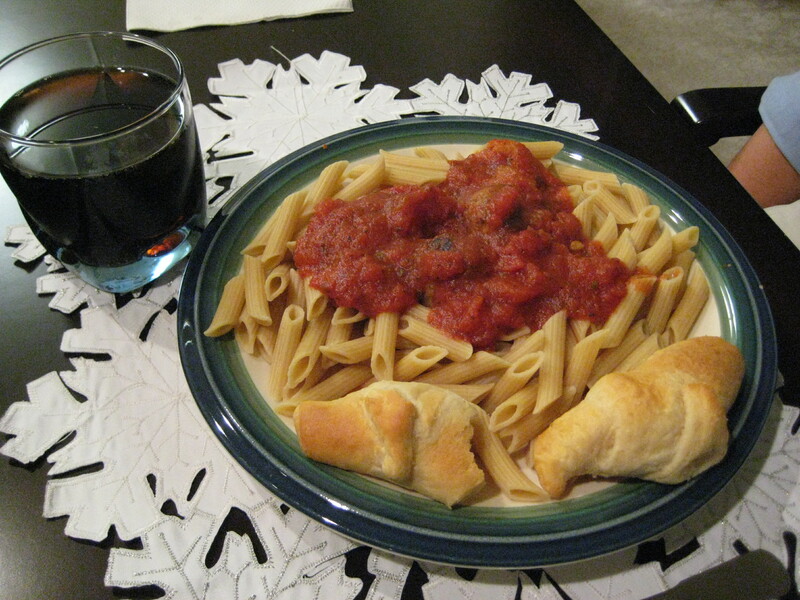 I made him regular pasta with Trader Joe’s turkey meat balls and, of course… crescent rolls! Jack thought Dave’s meal looked really good! Unlike his brother, who steals food in secret, Jack is very upfront about his theivery! 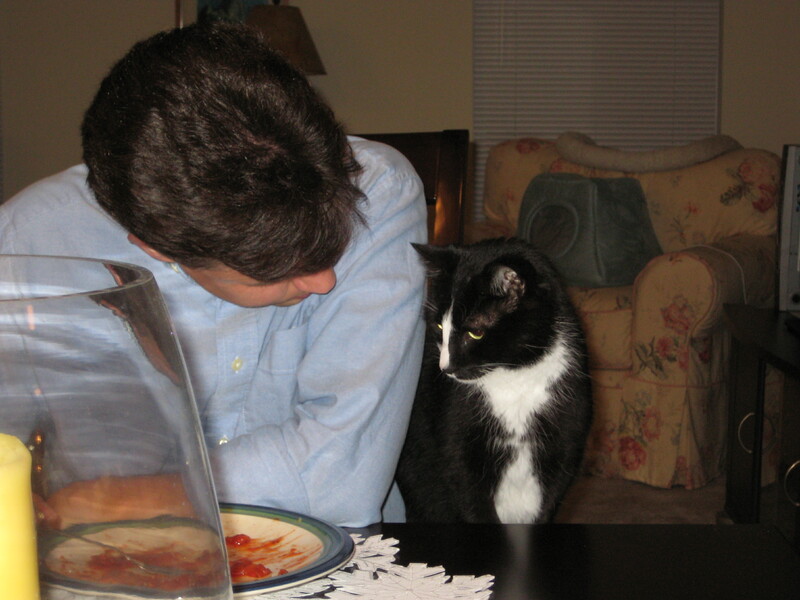 Before tonight’s dinner can be stolen off of the counter, I had better go attend to it! Today was a momentous day. 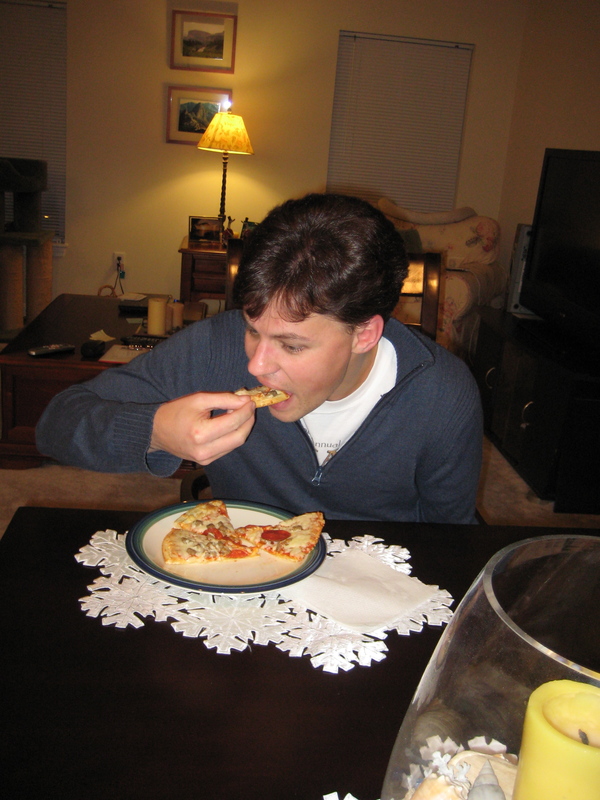 Since college, I have had the same dining table. My mom and I bought it for my first apartment, and for a college kid, it was a fine table. But it was definitely time to say goodbye! There were only 2 chairs, for one. This made entertaining next to impossible! On the infrequent occasions when we had someone over to dinner, we would drag the desk chair into the dining room so that our guest wouldn’t have to sit on the floor! In our new apartment, the table was almost comical…much to small for the space. It has 2 leaves, so we can open it up for all 6 chairs and lots of guests! Anyone want to come to dinner? Making today even better….No stomachache! A little bloated still, but no pain! I am trying not to get too excited, but this is very encouraging. I have lots of foods to try out in the next few days. Today, I tried my new corn tortillas, with eggbeaters and salsa. I was going to use refried beans, but “yeast extract” and “natural flavor” were in the ingredient list, and I wasn’t sure if that might mean there was hidden gluten. The picture is far from exciting, but they were good. Gobbled up while studying for Biology. I had lots of little meals and snacks to break up my studying! For dinner, I tried out the Shiritaki tofu noodles. I had heard that they smell horrible and that they have to be rinsed. Boy, oh, boy…do they ever! But amazingly, after rinsing them and heating them in the microwave, the were really quite good. I didn’t have them plain, so perhaps I wouldn’t have liked them as much if they were “undressed,” but prepared with sauce and veggies, I liked them. 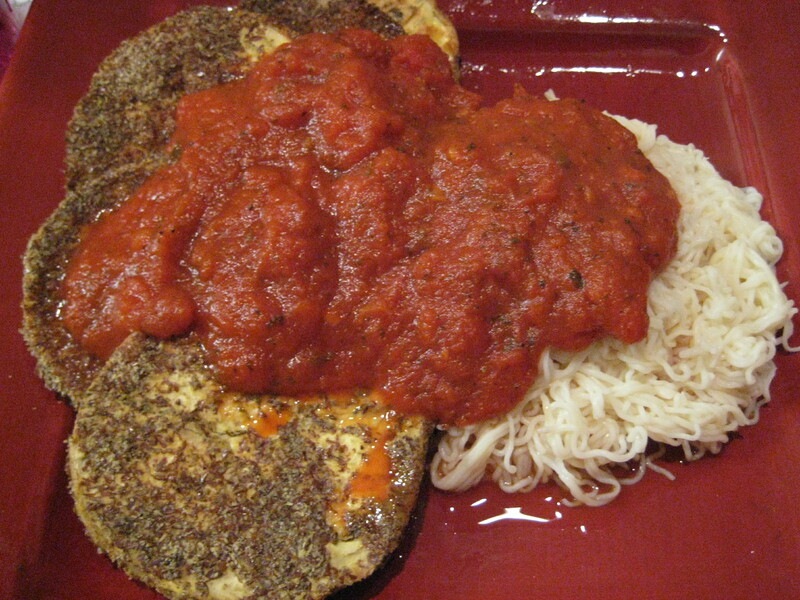 With my noodles, I made a version of eggplant parmesan. I dipped sliced eggplant in eggbeaters and then rolled the slices in a mixture of flax seed, parmesan cheese, and Italian seasoning. I baked them at 400 for about 40 minutes, and at the same time, roasted some peppers, squash, zucchini , and cubed eggplant. I added the roasted veggies to some marinara sauce and put it all over my noodles. So good! But pretty low in calories….I am going to be hungry again soon. Dave had regular wheat pasta with meatballs and my veggie sauce (plus 2 crescent rolls, of course!). But when I went to take a picture of his meal, I realized that our new table has us sitting much further apart! Check out the steam rising from my plate! On the agenda tonight is last night’s DVR’ed Gossip Girl! I’m so excited to watch it…I hope this post isn’t full of typos! I have so appreciated everyone who has reached out to me. Keep sending those feel good vibes! I think it’s working! Was there an event or a purchase that made you feel like an adult? Getting married, buying furniture, and researching houses to buy have all made me feel more grown up…good thing, since I’m 31 now! I found myself humming that song today, as the rain blew out of here and today became a beautiful summer day. I’ve told you how much my dear husband dislikes vegetables…Given that, I take it as a true sign of love that he planned a surprise trip for me today to a farm….specifically to buy fresh veggies! We went to Verill Farm in Concord, MA. What a great place! I’ve never seen so many kinds of tomatoes! Tomato stuffed with salmon. Yum!! We went to Lexington, MA, less than 10 minutes from where we live. When we came home it was time to start dinner. I pulled out some more local produce and made my own version of eggplant parmesan. So easy! I just sliced, dipped in egg, then dipped in a dish of bread crumbs, Italian Seasoning, and parmesan cheese. It baked up with the perfect amount of crispiness! Note the addition of Pillsbury Crescent Rolls and chicken to Dave's plate! Cats don't even eat tomato sauce! What a relaxing day! This is my last week before classes start, so lots of odds and ends to do before then. We are off to the Cape for Labor Day weekend, so I have until Friday to get myself ready to go!